This image isn’t some special effects from the latest Hollywood movie, but rather a picture of a lightning storm in Boston circa 1967. Last night, I experienced a lightning storm of that magnitude over the Philadelphia region. We heard on the news that between 7-8pm, there were over 2000 strikes. Between 8-9pm (as I drove to fencing practice), there were over 3000 strikes. It was a really strange primal experience. I felt my heart racing and my arm hair rising as I drove up 95. The sky was bright enough to drive without headlights with the constant flashes. It kept my peripheral vision working in overtime, and I had to fight to keep turning my head. There was this primal fear that kept creeping up on me. I finally turned off the radio and gave 110% of my attention to driving, waiting at any minute for the car next to me (or me) to explode in a bright white light. It looked surreal, with low hanging clouds and both horizontal and vertical strikes, plus the cloud lightning. The storm gods were mad last night, and they showed it. Now Playing: Paul Thurrott with Leo Laporte – Windows Weekly July 2008 – Windows Weekly 68: Mobile Who? 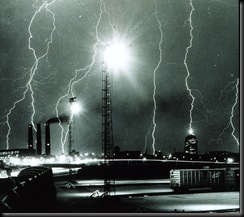 This entry was posted in On My Mind, Personal and tagged fear, lightning, storm by Weezel. Bookmark the permalink. Next → Next post: What big teeth you have..